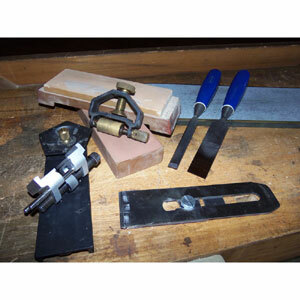 With the constant jokes circulating the woodworking workplace, there ought to be an award for who gets to be “the sharpest tool in the shed.” And as a newcomer to the field, until lately I would rank a non-starter. I have been catching up on my reading, and being drawn to the attractively-bound volume, recently picked up The Joiner and Cabinet Maker, reissued and expanded by Lost Art Press. It contains not only the original 1839 text, but also an historical analysis of the techniques and tools, and then the process of building the three projects contained in the text by the apprentice cabinet maker “Young Thomas.” In one passage, the young apprentice is tasked with making a packing box, and finds the tools common to the apprentices to be in poor shape, befouled by shavings, edges dulled and dinged by nails, and the hone dry and hollowed. Instead of regrinding all three planes he needs, he is helped by his journeyman friend Robert, who lends him a hone to sharpen one plane and a second plane of his own to complete the commission. The protagonist immediately recognizes the necessity of beginning a task with tools prepared to do their job, rather than risking the outcome with poorly cared for tools. I am not the person to teach you to sharpen. I am perhaps more an object lesson for the maxim “anyone may learn to sharpen,” just as Katy, age 8, is in Schwarz’s reworking of the Joiner and Cabinet Maker. Katy can sharpen, I can sharpen, you can sharpen. Unlike Katy, I spend my childhood rigorously sheltered from the shop where straightforward carpentry and house-building occurred, and sharp objects in general. At the age of 13, my grandad gifted me a buck knife, I imagine, to the horror of my parents. But I grew up in the grip of that horror, and never did anything interesting with the knife, or anything else sharp, beyond slicing open my knuckle and never telling anyone (… oh). And so I have carried on into adulthood. I never attempted nor considered it within the realm of possibility that I could sharpen until recently, when I took Jim Dillon’s sharpening class. As I was not in the habit of bringing an assortment of tools to work every day, I chose a couple bench chisels from our workshop that needed a little TLC (tender loving care, not the 90s girl group. Though woodworking would definitely benefit from an infusion of feminist R&B). In Jim’s class we covered three basic systems of sharpening, from low-tech to high-tech, on which I’ll elaborate: sandpaper, water stones, and the Tormek grinder. I had the opportunity to both learn about these in the classroom, and later, to try them out in the wild, unsupervised and at my own peril. The good news is everyone survived. The better news is that my forays into woodworking are safer and more effective because of learning this vital skill. CLICK HERE to read Part 2 – Amy’s thoughts about the first of the three basic systems of sharpening she learned.